The U.S. is loaded with amazing hiking trails. Thanks in large part to our extensive National Park system, there are still plenty of places out there where you can surround yourself with the beauty and majesty of nature-- and challenge your stamina and courage. From daunting rock climbs to more relaxing forest treks, these day hikes will show you the best of America’s natural splendor. These should be on every hiker’s bucket list. They will blow you away in beauty and make you feel like you really accomplished something when you get to the top. On the market for a new backpack for your next big adventure? Check out our in depth guide on the best hiking ﻿﻿﻿b﻿ackpacks﻿﻿﻿ for any occa﻿s﻿ion﻿﻿﻿. 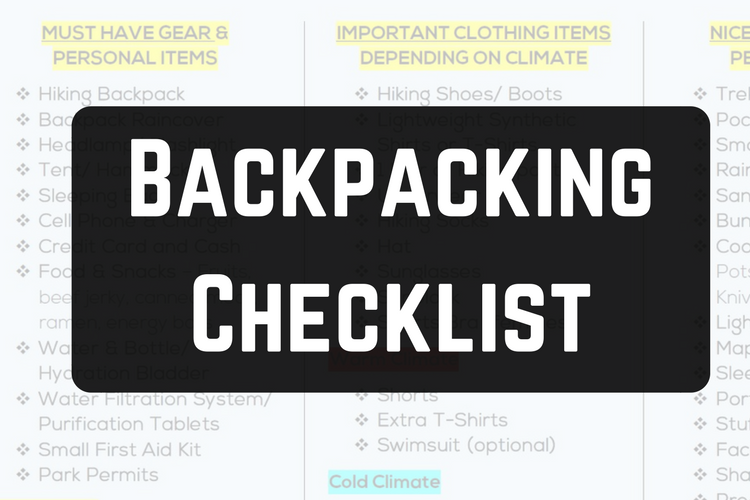 We have broken down our list to have the best daypacks, multi-day packs, and week plus journey packs. Check it out HERE. This hike changed my life and set me on a course that I have never looked back from. This day hike more them met my expectations and it gave me a hunger to see more of the United States National Parks. However, this is not a hike for those afraid of heights. While there are hand cables and chains along parts of the trail, it is a true test of nerves. The reward for those intrepid hikers who brave this trail are some truly jaw-dropping views of Zion Canyon. I have done many day hikes in North America and abroad and this one is still amongst my top 3. I was freaking out the whole way up the cables portion, but once I got there I was blown away by the view from all directions. There really is nothing quite like it with all the colors and mountains and valleys on every side of you. This changed my appreciation for hiking and after I went on this hike, I rarely wanted to use my vacation days on city trips, but have opted for beautiful natural destinations like Utah’s incredible Zion National Park. I simply had to see more! Maine is home to the gorgeous Acadia National Park. Maine is quite a cold destination in the winter (just below Canada), but when the weather starts to warm up in the spring and summer, the Acadia National Park starts to really get some visitors. For those passionate hikers out there, this park and hike is worth the trip. The Precipice Trail is a 1.5 mile out and back route that will take you on an almost vertical 1,000 foot climb up the face of Champlain Mountain. Iron rungs, ladders and rock ledges will help you pull yourself along, but be prepared for an upper body workout. You’ll be surrounded by breathtaking views of Acadia National Park, and if you’re lucky, you may even spot one of the peregrine falcons that nest there. For those outdoor lovers who want to see an often unexplored part of the United States, head to Maine and get yourself a lobster roll and see some breathtaking views at Arcadia National Park. This is by far the most strenuous and challenging day hike in Yosemite Valley. I know because I have done it and it was a full day to say the least. I think at the end of the day, I looked at my Fitbit Alta activity tracker and I had hiked almost 20 miles’ roundtrip and over 45,000 steps! It was an exhausting day to say the least. But it was worth it and I would definitely recommend you check out this legendary hike and perhaps America’s favorite and most popular national park. The trail is a long, steep hike that requires a good 12 hours to complete. It took me around that as we got there bright and early before 6am and didn’t get back until dinner! Along the way, you’ll enjoy the sights of the Vernal and Nevada waterfalls. The uppermost portion of the trail is essentially a vertical climb up rock face using cables. This is highly difficult after you have already been on the upward climb all day. It’s not for the faint of heart for those like myself that are afraid of heights. You just hold onto the cables and try not to look down. It can also be difficult and intimidating as you can only go as fast as the person in front of you. Hikers squeeze by you coming down when you are going up (and vice versa) making it a little nerve racking for those with big packs and sometimes the limestone surface is a bit slippery (even without rain). Thankfully there are wooden planks that you can rest on until you get to the next step up. So it was a bit nerve racking going up to say the least. Going back down using those same cables can be even more challenging. And don’t even think about going to the peak if the weather is poor. BUT, all this to say it was and is worth it! Why put yourself through this agony? Because at the top you’re at an elevation of 8,842 feet and you can see forever. I had a feeling of accomplishment like never before when I completed this hike and I can promise you, you will too. Just make sure to get cable permit well in advance if you want to do the cable portion to the peak. They only have limited amounts of people that they allow to go up to the top do to the amount of people that come to Yosemite each day, so make sure to grab that permit well ahead of time. Glacier National Park is almost always listed as one of the most scenic and beautiful parks in the United States. It’s no wonder so many people love it. The Highline Trail is among the best day hikes Glacier National Park has to offer. It takes you along the Continental Divide, which is known in this area as the Garden Wall. While there are some narrow sections of the trail that will require complete focus, you’ll be able to enjoy the scenery along the way for most of this trail. Alpine meadows dotted with wildflowers and wildlife await your discovery, so keep your eyes peeled for bighorn sheep, mountain goats and marmots. Personally, Glacier National Park is still on my bucket list and I am hoping to visit Glacier this upcoming summer. I have seen and heard nothing but good things about the beauty of this park and the wonderful trails to explore. I am positive you will find Glacier National Parks top day hike, the Highline Trail, to be among your favorites! Rocky Mountain National Park is widely popular park in one of the nation’s most beautiful states (arguably), Colorado. People flock here in droves to see this beautiful gem and go on some of the best hikes in America. Ready to take the plunge and buy a new, updated hiking backpack? We put together an excellent list of all the t﻿﻿op﻿﻿ hiking backpacks you ﻿﻿could ﻿﻿ever want. The hike begins in dense evergreen forest and ascends to the top of Longs Peak. At 14,259 feet, it’s the highest point in Rocky Mountain National Park! You’ll make your way along a gorge with views of Columbine Falls and Peacock Pool. Stunning Chasm Lake is your ultimate goal, and to reach it you’ll make a steep climb up the headwall, which requires some rock scrambling and route finding. If you want to get some great fresh air and experience the beauty of Northern Colorado, check out the Rocky Mountain National Park. The Northwestern part of the United States is widely known for its beauty and this park is no exception. The Olympic National Park can be found in the state of Washington’s northern peninsula and features some dramatic peaks of the incredible Olympic mountains. This trail is relatively flat, until you reach Glacier Meadow, so you will have plenty of opportunity to marvel at the magnificent rainforest around you. Stop for a break at the huge gravel bar that makes up Five Mile Island to enjoy the views and try to spot elk. Further along, you’ll be able to see the enormous glaciers that feed the remarkably blue Hoh River. This is another great hike for admiring flora and fauna. You will be amazed at the beauty of this park and in awe the whole way on the Hoh River Trail. For those that haven’t been to Washington, I think you will be amazed by the natural beauty of this state. Simply a day trip to the city, provides more natural beauty than most of my home state, Texas. Just make sure to plan your trip when there isn’t a high expectation for rain, if possible, unless you love getting wet. I, for one, enjoy my hikes without rain, but hey, when you’re next to the beautiful big green trees on every side maybe it won’t bother you too much. As expected, the summer time is perhaps the best time to visit the Olympic National Park as long as you can put up with bigger crowds. We couldn’t mention one of the United States best hikes without mentioning Hawaii. Hawaii is not only a great relaxing destination, but an unbelievable beauty to see and explore. The Kalalau Trail will take you to a part of Hawaii that most visitors will never see. The rugged trail provides the only land access to secluded Kalalau Beach on the north shore of Kauai. To get there, you will climb mountains, descend valleys, ford streams, and pass majestic waterfalls. Have I got you excited yet? All this, while snaking alongside some of the most gorgeous coastlines in the United States. Don’t miss the amazing views from Crawlers Ledge. Hawaii isn’t necessarily the cheapest destination, but if you are looking for a great day hike, then make sure you check out the Kalalau Trail in Kauai. It’s worth it to pay the money and purchase the plane ticket to see America’s favorite island. Ever been to Tennessee? If you have, I hope you visited the Great Smoky Mountains National Park. This famous national gem straddles the border of Tennessee and North Carolina. If you go at the right time of year, the colors and foliage will blow you away (fall time/ spring time). You might even be surprised to find some classic hiking trails along the way. Among them, we highly recommend you do the Mt. Cammerer Loop. This trail will take you along part of the famed Appalachian Trail. Once you reach the summit of Mt. Cammerer, you can go even higher by climbing the stone fire tower. From there, you can enjoy 360 degree breathtaking views of the Pigeon River Gorge and surrounding mountains. Time to get real... Ready to update your flimsy hiking backpack? We got you covered with this Epic Style Hiking Backpack Review Post. Quite frankly, we know you will love the Mount Cammerer Loop on you next day hike to the Great Smoky Mountains National Park. You didn’t think we could make a top ten list of the best day hikes in America and leave out Alaska did you? The Wrangell-St. Elias National Park and Preserve is a favorite for those that make the journey out to North America’s farthest north state. Just like most of Alaska, the views are fantastic and of course the hiking is excellent. You just have to get yourself there! This relatively moderate trail begins as a paved road winding through an old mining town. As you progress, you come to the Root Glacier. For those looking for a cold challenge, get your crampons on and prepare to hike a glacier. You can head toward the Stairway Icefall to explore glacial pools and a waterfall. Keep an eye out for bears along the way. No I am not kidding. Regardless of your level of adventurousness, seeing Alaska should be on every American hikers’ bucket list. The mountains and natural beauty of Alaska is simply spectacular. Redwood National Park is home to some of the best hiking trails in California. When you think of places to hike in California, you probably wouldn’t think of magnificent forest, am I right? California is so large and industrial that I think the magnificent redwood trees and forest often gets overlooked. Of course you have to drive your way well north of San Francisco, nearing Oregon, to get there. But I would say it is more than worth the trip. And if you really have the time, there is nothing quite like driving the coastline from southern California all the way up to Oregon. It’s a long drive, but you won’t be able to keep your eyes off the beautiful coastline. The Miners’ Ridge and James Irvine Loop is a fantastic trail to hike. Not only will you get to hike through spectacular redwood forests, you’ll pass through sandy Gold Bluff Beach and Fern Canyon. True to its name, the canyon’s steep, vertical walls are lined with ferns. Take the stairs out of the canyon and continue on to the James Irvine Trail to enjoy more of the forest from a different vantage point. So be prepared to be amazed as the Redwood National Park will show you the amazing beauty of yet another great California national park. Summing It All Up – Which Hike Should You Do First? So whether you live on the east coast, the west coast, or somewhere in between, there is a spectacular hike out there calling your name. These hikes may not be easy, but the scenic rewards make them well worth the effort. If you have the time and stamina to do a couple hikes why not fly into northern California (San Francisco) and drive out to see the Redwood National Park and Yosemite National Park. You can knock off two excellent day hikes from our list. Personally, in all my travels, I have found Colorado, Utah, and the northwestern United States to be among the most beautiful so it is no surprise that some of our favorite hikes are listed in these areas. That being said, the Appalachian Mountains to the east are mind blowingly beautiful and the history of the eastern part of the United States is enthralling. But go where you are most excited to go. I myself, have a great desire to see Alaska and hike the lush trails of Hawaii. There is so much to explore in the U.S. and we would be remiss to not visit at least a few of these excellent trails. If you really consider yourself an outdoor enthusiast, maybe you can hike all ten. Ready to accept the challenge? The important thing is to go. One at a time and you will slowly get to your goal. I’m planning on visiting one of the 7 Wonders of the Modern World each year until I complete all 7 (2 down so far). If I had said I had to do it all at once, I probably would not have been very successful. But once a year I can do. What hikes have you enjoyed the most? Let us know below what your favorite American hikes are. About to embark on a long backpacking trip and are you in need a new lightweight hiking backpack? We put together an in depth guide of the ﻿﻿Best ﻿﻿Hiking Backpacks in 2017﻿. Check﻿﻿ ﻿﻿﻿﻿out ﻿﻿our list by clicking this ﻿﻿LINK﻿﻿. Yep, Yosemite is pretty legendary. These are on my list, for sure! My husband and I love our National Parks and treasure every moment we get to spend in them. We hiked the first two miles of Kalalua in Kaui. WOW. Stunning and difficult and worth every moment of it. That’s awesome RoseMary. I think the National Parks are some of the most underutilized assets in the United States. Good to hear about Kaui… definitely on my list!